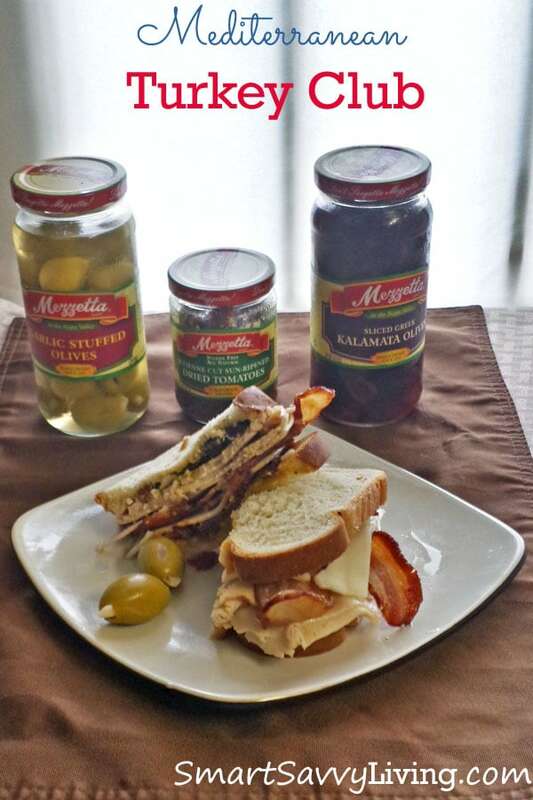 This Mediterranean Turkey Club Sandwich recipe was made with ingredients and monetary compensation from Mezzetta. Growing up I didn’t eat very many sandwiches other than the occasional fried bologna with cheese or banana and peanut butter, two common southern staples. My mom was never a huge fan of sandwiches, so it’s not something I was used to eating. Can you believe I never even had a peanut butter and jelly sandwich until I made one for myself as a tween? I know! Today, though, I love trying out all sorts of different sandwiches. Over the years, the classic turkey club sandwich has become one my favorites since turkey is one of my favorite meats to eat, and everything is better with a (or many) slice of crisp, crunchy salty bacon, right? However, as much as I love turkey clubs, the same old same old can get, well, old. That’s why I was happy to reinvent one of my favorites with the help of Mezzetta products! For my Mediterranean turkey club sandwich, I chose to use Mezzetta’s sun dried tomatoes and sliced Kalamata olives, plus I love olives so much, I had a couple of the garlic stuffed olives on the side. 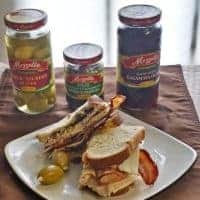 While I didn’t include them on the sandwich, Mezzetta also sent me a few jars of grilled artichokes and – oh my – they are so delicious I have been eating them straight from the jar! Keeping up with the Mediterranean theme, I also used sliced goat cheese (feta would also be great), sliced red onion and spinach. I then filled out the sandwich with sliced turkey, crisp bacon and a smear of mashed avocado (mayo would also work great) on a couple slices of sourdough bread. The resulting sandwich was SO good and a nice change from the same old classic turkey club! It was full of salty goodness from the bacon, and olives, a bit of tang from the sundried tomatoes (PS, I love using these since the taste of fresh tomatoes are always hit or miss for me), the light meatiness of the turkey with the crunch of the bacon and onion. All the components I love in a great sandwich. In fact, it’s so good that I’m going to enter it into Mezzetta’s annual “Make That Sandwich” contest for a chance to win $25,000! Want to enter your own sandwich for a chance at 25 grand? Just head over to the Make That Sandwich site for more details. The contest doesn’t end until 9/2/13, so you have plenty of time to get your entries in. Also make sure to scroll down below as I’m also giving away $25 in Mezzetta products to help you make your own star sandwich! This Mediterranean turkey club sandwich is a tasty change from the classic. Cook bacon to desired crispness. I like to bake mine at 375°, usually about 5-10 minutes. Spread a thin layer of mashed avocado, mayonnaise, or other desired sandwich spread on one side of each slice of bread. On one slice of bread, place several sun-dried tomato slices on top of sandwich spread. On the other slice of bread, place several slices of olives on top of sandwich spread. On top of tomatoes, place slice or crumbles of cheese. On top of cheese, place bacon. On top of olives, place sliced onion. On top of onion place several spinach leaves. On top of spinach place several slices of turkey. Place halves of the sandwich on top of each other and slice as desired. This same sandwich would also be great with meats like roast beef, ham, etc.! Win It: Thanks to the generosity of Mezzetta, one lucky Smart Savvy Living reader will win $25 in Mezzetta products to help make a delicious sandwich for the Make That Sandwich contest! What you receive may vary, but I received a box full of several jars of different varieties of olives, tomatoes, peppers and artichokes. Winner must live in the 50 United States + DC and be 18+. Prizes cannot be sent to PO Boxes. Giveaway ends 7/28/13 and winner will have 24 hours to respond to winning notification sent via email. All entries must be completed on the Rafflecopter below, please allow a minute for it to load. Check out one of my favorite sandwich sides, Mustard Potato Salad, if you enjoy this Mediterranean Turkey Club Sandwich! This looks so yummy! I want to make it for supper! Sundries tomato sand which spread, that looks delicious!! I want to try the Mediterranean Olive Sandwich Spread. I look forward to trying the Kalamata olives in my sandwich. I’ve been buying Mezetta products for decades. I love their pepperoncini. I want to try the sun dried tomato sandwich spread.